Isn't she precious? And those hands! Look at those hands! Those are worker-man, "dirt worshiping", farmer boy fingers! Don't we love that? Is that NOT the epiphany of love? 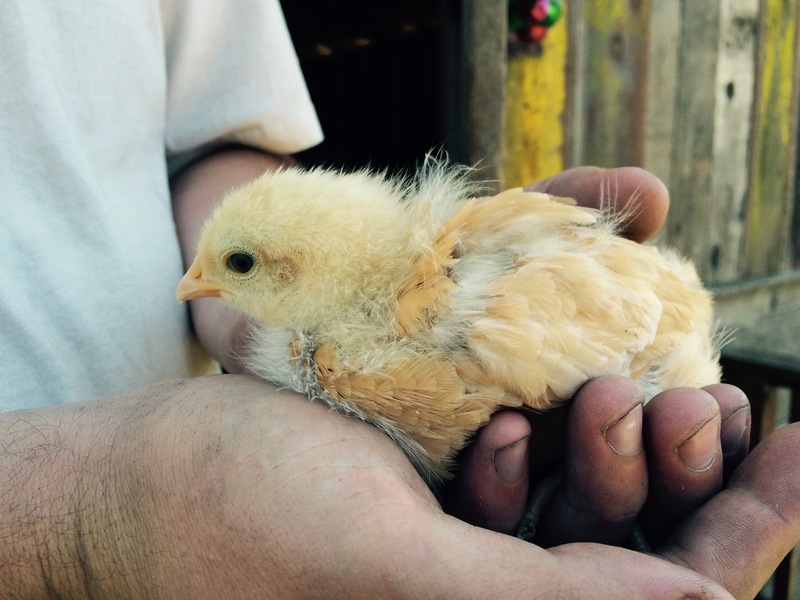 Dirty, hard-working hands, combined with a sweet and innocent lil' chick. Love it. After having chicks of our own, I have become a lot more interested in all the different breeds, sizes, colors, moods, etc. that go along with raising chickens! But I became especially intrigued in the history of these breeds..
Did y'all know that Buff Orpington's originated in Orpington, Kent, United Kingdom in the late 1800's? The first ever Orpington was bred by William Cook in 1886 by crossing Minorcas, Langshans, and Plymouth Rocks to achieve this very popular new hybrid bird. His first Orpington was black, William wanted a color that would hide the dirt and soot from the London streets very well. He then showed this new breed in Madison Square Garden in 1895 and the popularity of this new breed SOARED. He focused his breeding efforts on developing the traits of this new breed, and in this process, many birds came in different color and patterns. He then kept breeding the new chickens with their unique colors with other Orpingtons, and before you knew it, he introduced many different types of Orpingtons. He first introduced Black, then the White Orpington, the Buff, the Speckled, and the Mottled. His son-in-law, A.C. Gilbert, then went on to breed and create the Blue and the Cuckoo Orpingtons. Pretty interesting, right?! What have been your experiences with Buff Orpington chickens? I'd love to hear about the attitudes you've experienced, the colors of their feathers, anything really!